Chapter 1 sets the foundation for the book and our understanding of marriage. Our marriage must begin with a right understanding of God as is revealed in God's Word, the Bible. The heart of the Bible is the Gospel of Jesus Christ which is the good news for sinners. 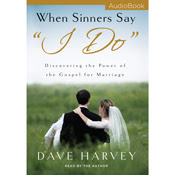 Being a sinner means we need the Gospel every day and in our marriage. Take time after reading the chapter this week to discuss the following questions with your spouse. 2. R.C. Sproul states, “No Christian can avoid theology. Every Christian is a theologian.” Think of some of the events of your last week. In the way you handled or processed these events, what did it say about your thoughts about God? 3. “The Gospel is the heart of the Bible” (P.24) If someone asked you what that means, how would you answer? 4. What does the statement “Marriage was not just invented by God, it belongs to God” mean? 5. Discuss with one another the basic and challenging claim of the book – all the problems of our marriage can be ultimately traced to one problem – the problem of sin.